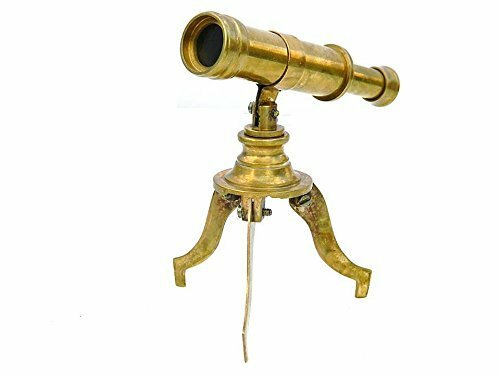 Humaira Nauticals Mini Desk Top Spyglass Telescope Antiqued Brass by Humaira Nauticals at Home Decor Outlet Store. MPN: unknown. Hurry! Limited time offer. Offer valid only while supplies last. Desk Top Brass Telescope on tripod. Fully functioning telescope. Dimensions: 10cmx9.5cmX3.5cm (4X3.75X1.25inch). Unique Home or Office Decor Item. Desk Top Brass Telescope on tripod. Fully functioning telescope. Dimensions: 10cmx9.5cmX3.5cm (4X3.75X1.25inch). Unique Home or Office Decor Item. Great addition to your maritime or pirate collection ship thorugh EMS. Desk Top Brass Telescope on tripod. Fully functioning telescope. size:Dimensions: 10cmx9.5cmX3.5cm (4X3.75X1.25inch). Unique Home or Office Decor Item. Great addition to your maritime or pirate collection. Desk Top Brass Telescope on tripod. If you have any questions about this product by Humaira Nauticals, contact us by completing and submitting the form below. If you are looking for a specif part number, please include it with your message.